Events leading up to Memorial Day include Armed Forces Week, free tickets for active duty military and veterans, a food drive and more. SOUTH BEND, IN - As a kickoff to South Bend's "Best.Week.Ever." festival, the South Bend Cubs will host the inaugural Military Honor & Appreciation Fair at Four Winds Field on Monday May 28. The fair is part of "Armed Forces Week", a special week of home games dedicated to the United States military service branches starting on Monday, May 21st and culminating with Military Appreciation Days on Sunday evening and Memorial Day. "Every year, we are honored to partner with Express Employment Professionals over Memorial Day weekend," said South Bend Cubs President Joe Hart. "This season, we have expanded the weekend to include the full eight game homestand as well as a Military Honor and Appreciation Fair to help bring awareness to issues that our active duty military and veterans are facing." Co-hosted by Express Employment Professionals, Military Appreciation Days on Sunday, May 27 and Memorial Day, May 28, will honor veterans and currently-serving military personnel by offering two free tickets to either the Sunday or Monday games with proof of service. On Sunday, visitors around the Four Winds Field Plaza will be visually inspired by 50 US flags placed in-line by the Indiana Patriot Guard Riders in dedication to Vietnam veterans. This display will recognize members of the Vietnam Veterans of America. The Combat Veterans Motorcycle Association will also ride their motorcycles onto the field, which will be followed by a live flyover and field landing of UH-1 Huey 369, a restored Huey helicopter from American Huey 369 out of Peru, Indiana. 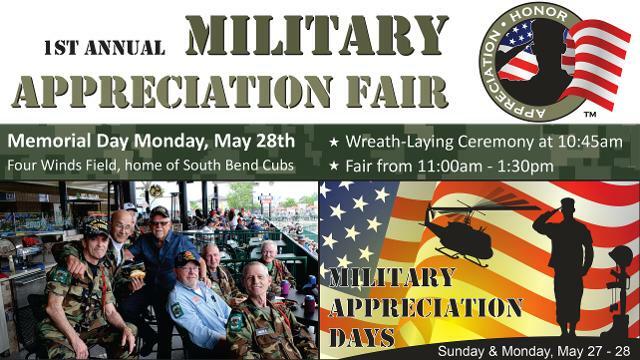 On Memorial Day, Express Employment Professionals and the South Bend Cubs will host the inaugural Military Honor & Appreciation Fair. The event starts at 10:45 a.m. with a special wreath-laying ceremony featuring area dignitaries that include Indiana's 2nd District Congresswoman Jackie Walorski, 95.3 MNC's afternoon radio host Casey Hendrickson, and South Bend Cubs President Joe Hart. Other participants will include the Miller's Vets Color Guard, area Boy & Girls Scouts, and representatives of the Indiana Army National Guard, who will perform TAPS and the National Anthem. Following the ceremony will be the Military Appreciation Fair. Over 25 local military service organizations will be represented along with military vehicles and equipment on display. There will also be a paintball shooting booth from BlastCamp out of Hobart, Indiana. All events on Monday will take place outside of Gates A & B in the Four Winds Field plaza. Prior to first pitch on Monday, the families of fallen service members will be recognized on the field, organized by US Army Survivor Outreach Services and Helping Hands for Freedom. In addition to the events on May 27 and 28, the South Bend Cubs and Express Employment Professionals will host a food drive during all eight games. Nearly 25% of food insecure Hoosiers are our military veterans. All food and money collected will benefit the Food Bank of Northern Indiana and their area food agencies, who help feed hungry and food insecure families across North-Central Indiana. Express Employment Professionals is a leading workforce staffing provider in the U.S., Canada and South Africa. Founded in 1983, Express Employment Professionals has nearly 800 franchise locations, including three franchise offices covering a six-county area and located in Mishawaka, Elkhart, and Warsaw, in North-Central Indiana. Express specializes in the placement of job-seekers with employers for commercial, administrative, skilled trades, and professional positions.